WEDNESDAY, Oct. 5, 2016 (HealthDay News) -- Early diagnosis of Alzheimer's disease in women may be more difficult than in men because older women tend to retain better verbal memory, according to new research. The findings suggest that memory tests for Alzheimer's may need to be adjusted for this gender difference, said a team led by Erin Sundermann of the University of California, San Diego. "Women perform better than men on tests of verbal memory throughout life, which may give them a buffer of protection against losing their verbal memory skills in the precursor stages of Alzheimer's disease, known as mild cognitive impairment," explained Sundermann. She conducted the research while at Albert Einstein College of Medicine in New York City. Sundermann said the findings are important "because verbal memory tests are used to diagnose people with Alzheimer's disease and mild cognitive impairment, so women may not be diagnosed until they are further along in the disease." Verbal memory involves the ability to recall words and other verbal items -- it's distinct from spatial memory of places, for example. The new study, published online Oct. 5 in Neurology, involved more than 1,300 people averaging 73 years of age. 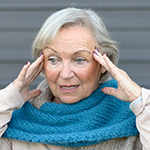 About 250 of them had Alzheimer's disease, just over 670 had mild cognitive impairment (including memory deficits), and 390 of the participants had no thinking or memory troubles. Everyone took verbal memory tests where they were given 15 words and then asked to recall them, both immediately after and a half-hour later. The researchers also took PET brain scans of each participant, looking for how well they metabolized glucose -- the brain's primary energy source. Problems in metabolizing glucose (sugar) in the brain is often a hallmark of Alzheimer's disease, the study authors explained. The investigators found that women tended to have better verbal memory skills than men -- even when their brains had similar problems metabolizing sugar. "These results suggest that women are better able to compensate for underlying changes in the brain with their 'cognitive reserve' until the disease reaches a more advanced stage," Sundermann said in a journal news release. "If these results are confirmed, adjusting memory tests to account for the differences between men and women may help diagnose Alzheimer's disease earlier in women," she concluded. One Alzheimer's specialist who reviewed the study suggested that the female "edge" in verbal memory may fade with time. "Women are better at verbal recall than their male peers and this advantage appears to persist even when they develop Alzheimer's disease," said Dr. Gayatri Devi, a neurologist at Lenox Hill Hospital in New York City. "As the illness progresses, however, the female dominance in this cognitive area disappears."